Karen has had an interest in the natural world for as long as she can remember and always knew her career would take her into the field of biology. 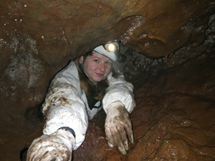 Karen received her Masters of Science at the University of New Brunswick where she studied bats and the pre-white nose syndrome fungal flora that occurs on them. She completed her Bachelor of Science (Hons.) in biology at the University of Western Ontario. She has previously worked with Ontario Parks performing plant and salamander field work and assisted in preparations for a Karner blue butterfly reintroduction. She has also worked with swift foxes, wood turtles and waterfowl. Karen enjoys spending time outside, especially exploring Canada’s national and provincial parks.